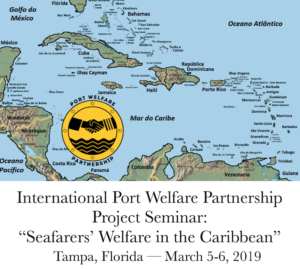 Introduction: With the support of the International Port Welfare Partnership (IPWP) project (portwelfare.org), this seminar brought together those interested in seafarers’ welfare in the Caribbean area. The IPWP is a project by ISWAN and the UK Merchant Navy Welfare Board to encourage and support the establishment of welfare boards and port welfare committees worldwide, in accordance with ILO MLC, 2006. 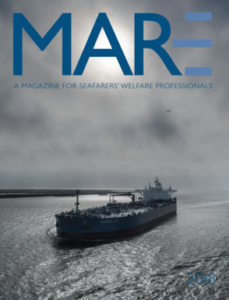 These committees provide the forum for maritime organisations to regularly meet and support port welfare services and facilities in improving seafarers’ lives. This IPWP 2-day seminar was hosted in North America by NAMMA in Tampa, Florida, March 5-6. Representatives of industry, labor, government, the media, and welfare providers from ports in the Caribbean, Bermuda, and nearby United States were welcomed. The goals of the seminar were to strengthen partnerships for port-based welfare service, share best practice, and plant the seeds for additional work for seafarers’ welfare in the future. Read more about the conference at The MARE Report. Hotel and Conference center: The Barrymore Hotel Tampa Riverwalk.